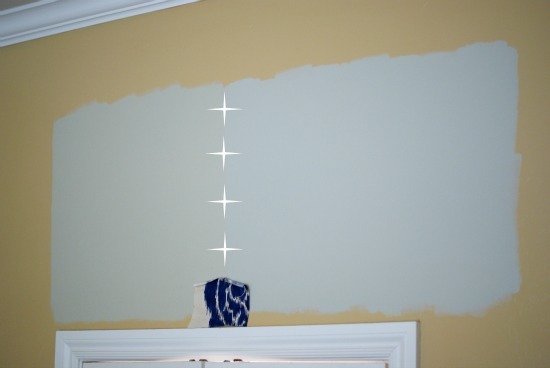 For over a year I've been planning to repaint my master bedroom. For months I've been thinking of fabrics that I want to used in there. Do you read House Beautiful magazine? I just subscribed a few months ago after many years of not receiving it, and have enjoyed looking through it's pages again. Upon receiving the latest issue a few days ago, I was pleasantly surprised when I saw the cover. You see, I'm totally infatuated with this blue fabric. I've been considering it for the drapery in my master bedroom. I've pinned it, more than once I think, on my Pinterest Fabrics Board (you can follow me on Pinterest here). If it's showcased in a beautiful magazine layout, I must be on the right track...right? Sometimes it's nice to have a little bit of validation like that with my design choices. I'm also trying to decide what companion color I want to use, red or coral or something else. Recently while on a day trip I found the fabric in a real store (I'd previously only seen it online) and was able to play around with some colors to go with it. Coral? Reds? I'm a little afraid of it coming across a bit patriotic. I'm all for the Red, White, and Blue, but not sure that's what I want in my bedroom, ya know? The one drawback is the price. 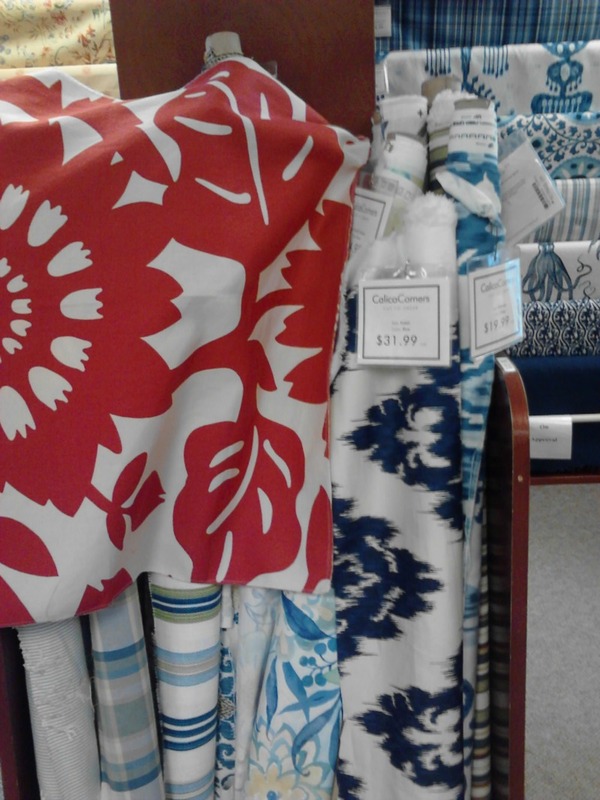 While not totally outrageous, it's more than I like to spend on fabric. 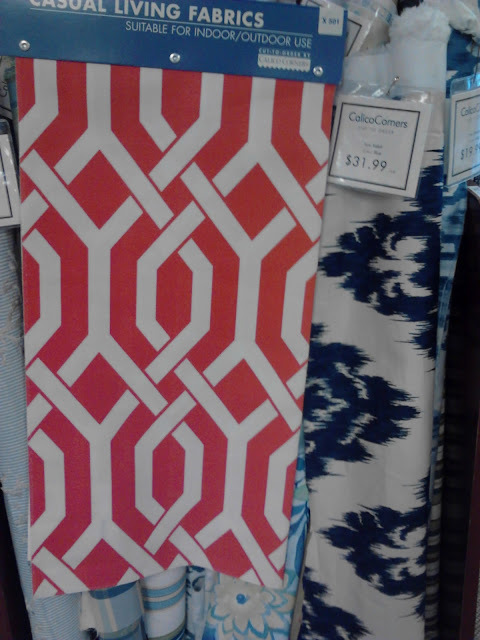 $20/yard (the lowest I've seen) for me is pretty steep, especially considering I will need close to 15 yards. I think I can do a bit better than that if it comes up on sale, but still, big investment. So, I'm still thinking and planning, and trying to finish up some other half way done projects. I'm close to biting off my master, and wish it was done yesterday already! 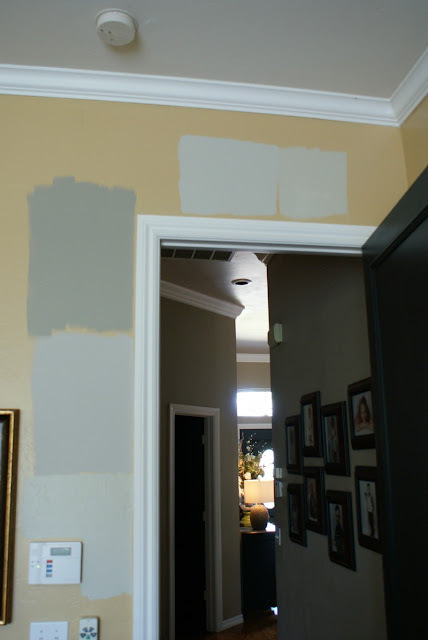 I'm playing around with paint samples also. I think these two are the front runners-hard to tell much difference but I separated the colors with the stars for you. What do you think? Am I headed in the right direction? I love that fabric and think you should go for it if you really adore it. It would pair so beautifully with coral. (Ange at The Blooming Hydrangea used those colors together in her master - so pretty.) 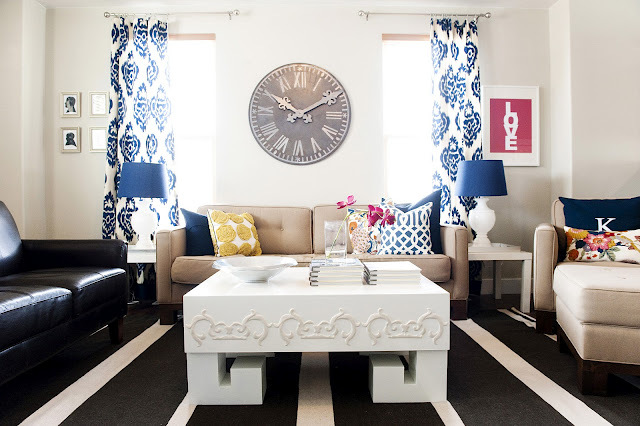 The stenciled version reminds me of Carmel's at Our Fifth House - I think you could get the look you want with stenciling but oy - that's a LOT of stenciling!! Wish I could come over and help you bang it out! I know how you feel about getting that validation. Makes you realize your not off your rocker! ;) You know you have a great eye. Sounds exciting and looks great so far. 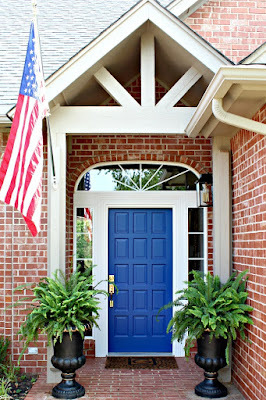 I think using non-traditional patterns and perhaps just a hint of red would downplay the obvious patriotic element. You have great examples to steer you in the right direction. 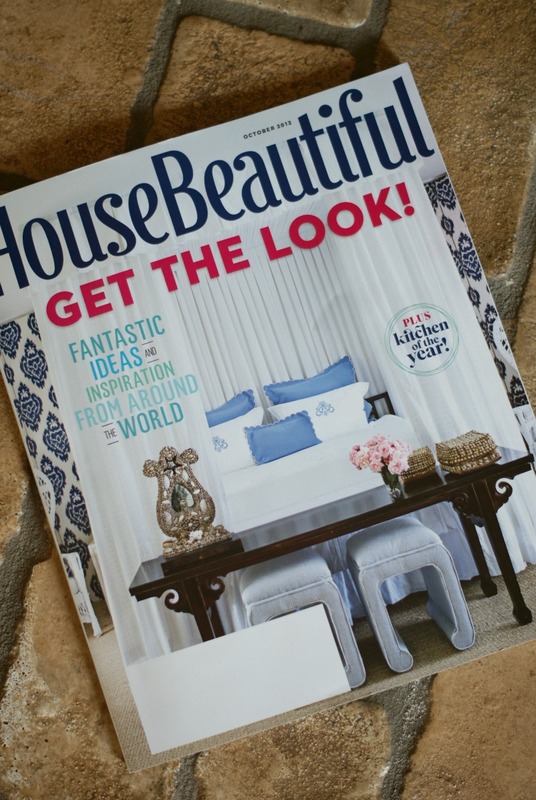 The cover of House Beautiful carries more weight than your bloggy friend's 'so pretty, love it, perfect choice?' 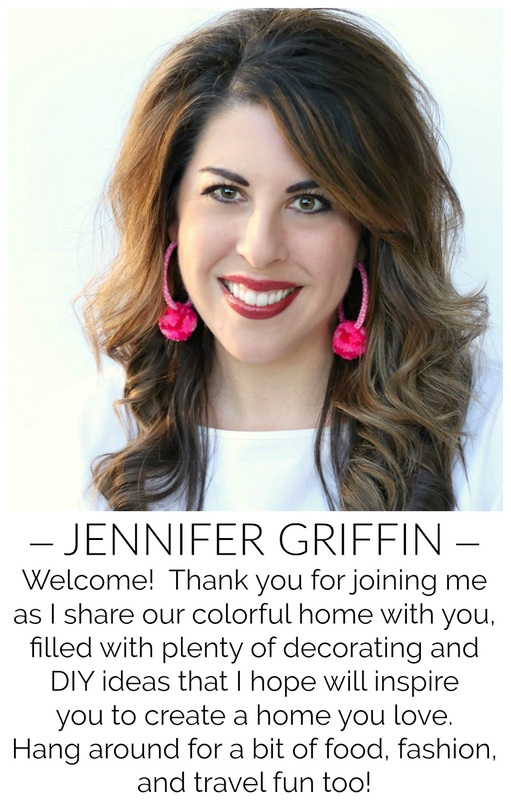 I really do love it and that coral trellis would be my pick! :) I haven't had a chance to look at my HB yet, but I always find great inspiration! As long as it makes you happy, yes ~ you're on the right track! :) The fabric is beautiful and it would be quite an investment. 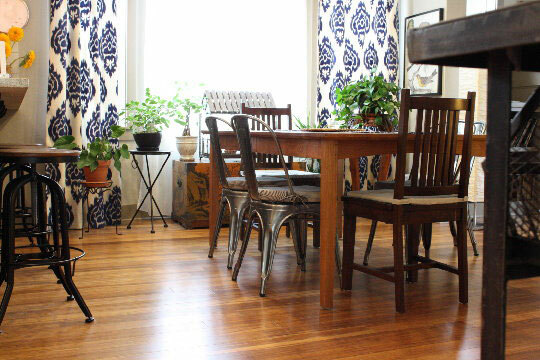 Maybe do a Pros & Cons list between that and stenciling. Of course, I adore red but coral would be pretty too! Perhaps small accents of the red? I know whatever you choose, it will be gorgeous! And the paint? Both colors are pretty. I kinda like the one on the right. Great fabric. I like it with the lighter gray on the right...it appears to have a bit of a blue undertone but might just be on my computer. Love it with the coral trellis. As to the price, I would pray! Amazing things find me that way! i am a huge fan of that fabric, too! i love it with the paint on the left in the frontrunner picture- it's a little warmer. and i am loving where you are going! I love your choices of colors, and the fabrics are gorgeous, I am always amazed by what great taste you have in fabrics, thanks to you, I see that dragon fabric every where now, and now I want a yard of it :(. 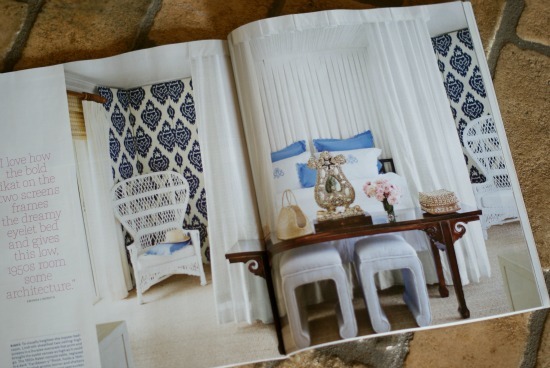 I love gathering inspiration from magazines too, good luck with your room, I'm sure it will turn out great. Yes! 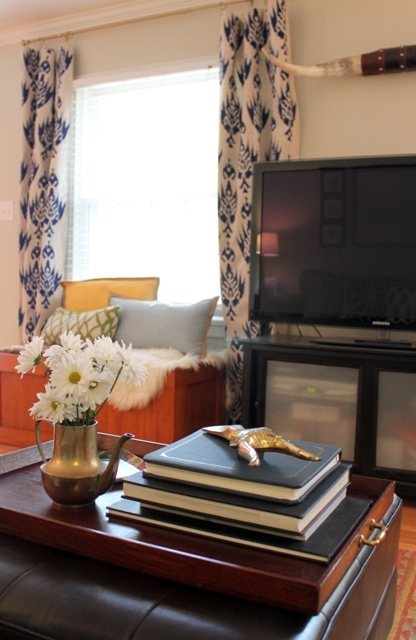 I love those blue fabrics and have been looking at something similar for my bedroom. Our bedroom is visible from the family room though and I'm going to finish pulling that room together first. Can't wait to see what you come up with. Thanks Amelia! I'd love to see a photo if you get a chance. You can e-mail it to me at dimplesandtangles@att.net or post it on my facebook page. I like the idea of adding some yellow in! you sure are! I like a bit of a weight in the grey - which one are you thinking? The guys at the paint store know me well after I donated for my own collection of gray paint samples!! :) Good luck!